A year ago. That’s when our family lost my mom. Her passing was instantaneous; it left us in shock and sorrow. Not two months later, the manifestation of that sorrow in Dad was initially diagnosed as grief-induced dementia. Four days later, there was a terminal diagnosis: brain cancer. Six months. Maybe. As an only child, I had to make rapid choices – and the ones available were far from optimal. 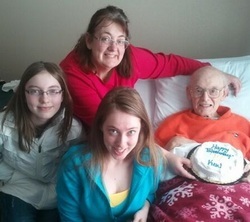 Move Dad back to his house in Cedar Rapids for hospice care. [Not chosen due to the distance from me and his granddaughters here in Iowa City.] Return dad to his Iowa City retirement community (where he’d just moved on a trial basis two weeks ago) where Hospice could visit. [Not chosen because Walden Place is a vibrant community where he would be sequestered in his own apartment yet in need of round-the-clock care]. Accept a spot at a skilled nursing facility (SNF) and receive Hospice services there. The SNF was the solution we chose. It wasn’t the best for many reasons, which is why I am writing to offer my enthusiastic support for a free-standing Iowa City Hospice House. Although the building was crumbling, the SNF care was good. Coupled with the Hospice care team, I could see the potential for families to have quality time with their loved one. However, Hospice services delivered in an SNF are not all they could be. Arguably not even close. Dad shared a room with an early stage Alzheimer’s gentleman who was present to rehabilitate from an injury. He was loud, confused, demanding and visited by many people at various times. This situation, which would not happen in a four-bed Hospice House with family space, was difficult for him and his family, and very difficult for us, too. Care received in a Hospice House would have allowed us to make choices appropriate to our family’s concerns, beliefs and traditions – listening to “What a Wonderful World” at 3 am when Dad was awake; meaningful visits with the chaplain so the worries of those facing a terminally ill could be addressed in private; saying daily good nights, goodbyes and our final farewell without unfamiliar others in the same room. A Hospice House would have meant the wonderful skills of Hospice nurses and staff would have been there for us 24/7 in a warm and homey environment. Such a place would have brought the focus at the end of Dad’s life on him, us and our loss – undisturbed by the needs of so many others in such different circumstances…patients expecting prompt responses to call buttons and demanding to attend bingo sessions. An Iowa City Hospice House would provide a comfortable and peaceful place for patients and their loved ones to benefit from the professional and compassionate end-of-life care that amazing people like Dad’s RN, Larry, deliver daily. Hospice is about quality of time and family time; a dedicated House would provide an environment for that. It would be an option that families would welcome. As it turned out, Dad had just six weeks. I kissed him that night at 11pm and went home for a shower. I didn’t expect that to have been my final goodbye, but it was. On my way out the door, Dad’s roommate was in his belligerent mood. CNAs from the facility attended to him; Dad slept. When SNF staff checked on Dad at midnight, he was no longer with us. A Hospice House would offer dedicated Hospice care - not care somehow divided up between medical staff being pulled so-many-other-ways and Hospice staff. I returned to say my final farewell –and Hospice volunteers and staff arrived within the hour to support me. I believe that scene would have been very different - more personal, more meaningful - had we been at a dedicated Hospice House. I would not have needed to leave to shower, I could have been at his bedside, there would have been prayers at that moment – and someone from Hospice would undoubtedly have been on-site to bolster me emotionally. Hospice did meaningful things for us – but their care would have been even more valuable when available in a Hospice House location. I hope that in sharing our family’s experience you understand what a worthwhile, appreciated choice a Hospice House would be for families in our area.